The leading reference on this topic has just gotten better. Building on the success of the previous two editions, all the chapters have been updated to reflect the latest developments in the field, and new chapters have been added on picolinic acids, oxathiapiprolin, flupyradifurone, and other topics. 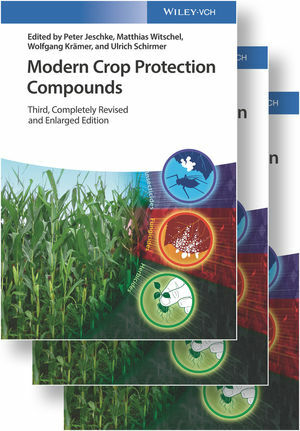 This third edition presents the most important active ingredients of modern agrochemicals, with one volume each for herbicides, fungicides, and insecticides. The international team of first-class authors from such renowned crop science companies as Bayer, Syngenta, Dow AgroSciences, DuPont (now Corteva Agriscience), and BASF, address all crucial aspects from the general chemistry and the mode of action to industrial-scale synthesis, as well as from the development of products and formulations to their application in the field. A comprehensive and invaluable source of timely information for all of those working in modern biology, including genetics, biochemistry and chemistry, and for those in modern crop protection science, whether governmental authorities, researchers in agrochemical companies, scientists at universities, conservationists, or managers in organizations and companies involved in improvements to agricultural production. Peter Jeschke gained his PhD in 1986 in organic chemistry at the University of Halle/Wittenberg (Germany), after which he moved to Fahlberg-List Company (Germany) to pursue agrochemical research before moving to the Institute of Neurobiology and Brain Research, German Academy of Sciences. In 1989 he joined Bayer in Animal Health Research and eight years later he took a position in insecticide research, where he is currently principal scientist in Small Molecules Research Pest Control Chemistry at Bayer Crop Science Division. Since 2011, he has been honorary professor at the University Düsseldorf (Germany). Prof. Dr. Jeschke is an Associate Editor for “Pest Management Science” of the Society of Chemical Industry (UK) and he has more than 240 patent applications and publications to his name. Matthias Witschel gained his PhD in 1994 at the University of Erlangen-Nürnberg (Germany). During his education, he also worked as a visiting researcher at UC Irvine (USA) and the College de France, Paris (France). After his post-doctoral stay at Stanford University (USA), he started in 1996 at BASF in herbicide research, where he is now senior principal scientist in global herbicide research, based in Ludwigshafen (Germany). Dr. Witschel is the author and co-author of over 270 patents and scientific publications. Wolfgang Krämer gained his PhD in organic chemistry from the TU Stuttgart (Germany) in 1968, after which he joined the Institute of Textile Chemistry at Stuttgart University, before moving to Bayer Plant Protection as lab leader in crop protection research in 1970. Between 1984 and 1990 he was Head of Global Chemistry Fungicides, and Head of Insecticide Chemistry thereafter. Retired since 2005, Dr. Krämer has over 250 patent applications and publications to his name. Ulrich Schirmer received his PhD in organic chemistry from Stuttgart University (Germany) in 1973, and subsequently carried out his postdoc at Paris-Orsay (France). He joined BASF in 1974, eventually becoming Senior Vice President responsible for plant protection research for chemical synthesis, process development and biological R&D. Since 2003, he has been working as a freelance consultant to start-ups in the fields of biotechnology, chemistry and agriculture. Dr. Schirmer is author and co-author of more than 100 patent applications and scientific publications.